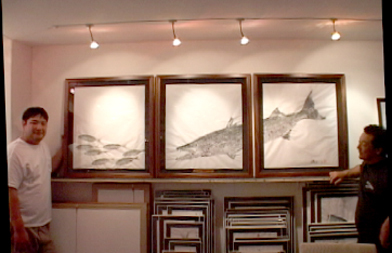 This koa framed gyotaku print is an excellent example how Naoki Hayashi's gyotaku reminds us of that special day and catch. This gyotaku was titled " Tagged Teamed". Here is the story. Pat and Chris Kadooka and I were the only ones to make this fishing trip to the Big Island. Pat bait-casted a live kupipi before he went to pick opihi. Not more than two minutes later hanapa'a. Chris grabbed the camera to capture video footage. That left me to go and fight the fish. From a distance Pat noticed all the comotion and ran back to take over the battle while I went to get the landing net. Within minutes Pat had the fish whipped and close enough for me to net this nice white ulua. Fighting, landing the fish and capturing this event on video was definitely a "Tagged Teamed" effort. Naoki believes there is a story to be told through every gyotaku. 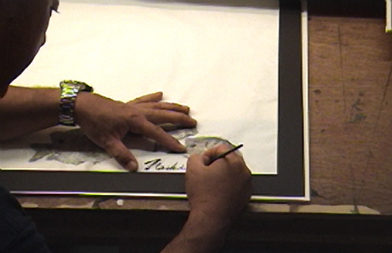 Click on the koa framed image to see a sample video clip of Naoki Hayashi creating this original masterpiece. 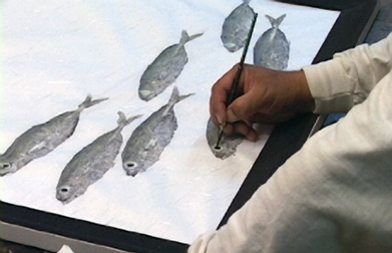 Images of Naoki Hayashi creating "Kaku On A Thread"
Lan and Naoki in the studio with the gyotaku "Kaku On A Thread"
capture memories of your special fishing adventures through Gyotaku.